If your dentist suggests you to take a root canal treatment, this post might be helpful for you. It is important to separate facts from lessons and find out some critical truths about root canal treatment. With this knowledge, you will be able to build confidence and hopes to make sure Root canal treatment goes well. And also you can be able to eradicate your problems from its roots. In fact, teeth composed of several layers. The outside layer is composed of enamel(Hard Layer). The inner part of the enamel is covered by the layer called dentin. Which is also called a pulp? If you are experiencing deep pain in the while chewing food or biting ice creams or any cold items, swollen gums near a tooth that is the sign of Root Canal Infection. When you feel no sensation after having cold beverages that are also a sign of infection, which causes due to dead nerve cells surrounding infected tissue. When you suffer from a toothache, you may also notice that your teeth hurt when you chew anything, and also when you apply pressure to the tooth. The reason treatment is essential because it helps to heal the pulp on its own. Our endodontist completely removes the pulp, clean out infection and apple filling. When do you require Root Canal Treatment? The treatment is needed when the tissue inside the root canal becomes infectious, painful sensation due to decay and trauma. This treatment helps you to restore tooth health. After giving local anesthesia to the affected tooth a small insertion is made to the pulp chamber. After removing the infected tissue, root canals are cleaned and germicide is applied. Also, it is sealed to prevent infection further, Root Canal Treatment in Melbourne is performed by our dentists in Melbourne clinic. Our dentists in Melbourne have a professional knowledge in the field of dentistry and endodontic procedures. At Holistic Dental Brunswick we provide the best dental services. When you undergo root canal treatment, the diseased pulp is removed, and the inner part of the teeth is cleaned and disinfected. Later it is filled with rubber kind of material called gutta-percha. The root canals are cleaned and disinfected with special instruments. Some use handpiece while some are used by hands. The process involves removing debris from the diseased teeth or canal and smoothing and shaping the corners of the canals. The canals are constantly rinsed to remove debris and initiate canal sterilization. In the process of root canal process, final restoration is very important. What happens during root canal therapy? Root canal therapy can be done by giving the local anesthetic injection. Our dentists in Brunswick clinic operate the pulp through the crown of the tooth. They also use some special equipment’s to clean the root canal attached to the pulp. 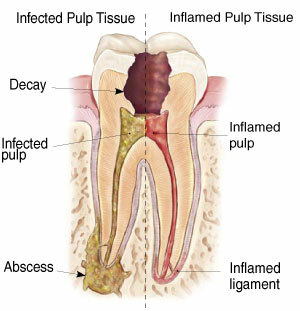 Once the infected tooth is removed, the pulp and root canals are thoroughly disinfected. At this point, dentists place antibiotics into the empty pulp, since the root canal infection is quite severe, the tooth will be temporarily sealed up. 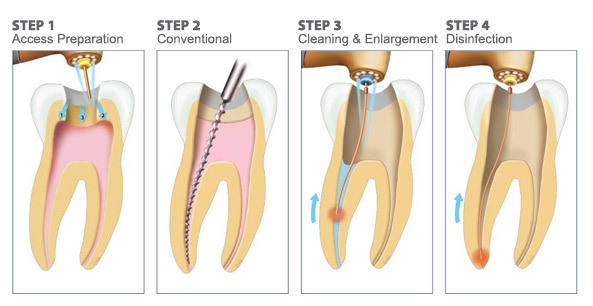 This is just to ensure that the root canal infection is removed completely before we restore the tooth. The tooth after root canal therapy is filled and sealed. Root canal treatment is excellent to save teeth but our dentists would suggest if you didn’t have an infected tooth. Dentists call in medical term as Endodontic Therapy. This treatment involves a procedure that is carried out to cure the infected dental pulps. Every tooth has two distinct parts – crown and root. Blood vessels, Nerves, connective tissues present in the inner parts of the root are known as dental pulps. Any damage to this part requires root canal therapy. Root Canal treatment it is a procedure for an infected tooth. 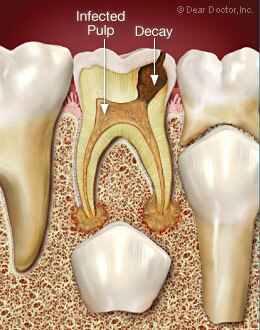 It is done in the cases where the tooth has a diseased pulp but the structure of the tooth should be in good shape. Many of the people don’t like to visit a clinic. This may be due to the fear of needle or negligence. In fact, according to the recent survey, 15% of the people do not visit dentists because of misconceptions and fears.when they look at the procedure involved in root canal therapy, they expect that it involves the painful process. Hence they don’t take risk of visiting dentists. But the truth is root canal is painless, according to the recent survey conducted by the American Dental Association, patients who have undergone root canal treatment expressed it as painless than painful. Before the procedure, a local anesthesia given to the teeth and the premises. This numbs the surrounding area and makes it painless. In fact, root canal therapy reduces the pain caused by infected pulp. This procedure lasts for 60minutes and it may also go further, depends on the patient’s dental condition. Since the nerves in the tooth have been removed, you may experience some sensitivity for a couple of days. This is because when the local anesthesia power wears off, the infected tooth surrounding may become sore. So dentists suggest chewing food on one side. The tooth doesn’t heal quickly and it needs some gentle care. Holistic Dental is the ideal choice for all your dental problems and issues. It is next to impossible to locate a good dentist in Melbourne.